When it comes to getting students excited about learning, the key is capturing their imagination — and getting them excited about what they're learning. But unfortunately, that doesn't always happen — especially in public schools in under-privileged areas. Enter a guy named Chris Emdin, who's a professor at Columbia University in New York City. 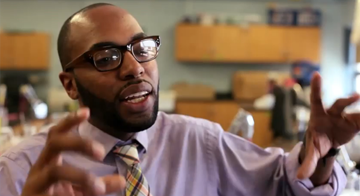 He has created a program that we absolutely LOVE called Science Genius — where he's using hip hop to teach kids about science. The main activity of the project will involve a call for students in selected schools across New York City to create science themed raps based on topics decided upon by the project sponsors (scientists, educators, and Hip-Hop icon GZA). The raps that students will create will be part of a competition within schools that will eventually grow into competitions among participating schools. The raps would be performed over the students’ choice of 5 hip-hop instrumentals provided by project organizers, and will cover topics that align to the New York State Science Learning Standards, and Core Curriculum. As you can see in the video below, the Science Genius program is changing lives in New York City, and getting students excited to pursue a career in science. Watch the video and let us know in the comments section below: what do you think of the work that Science Genius is doing? Would you like to see the program extended to other schools?